Car Shuttle Req'd: No Parking Directions: Take Highway 330 past Hana (if coming from the Hana Highway) to the Oheo Pools State Park. You will need to pay the entrance fee of $10 (as of 2013) to park and access the trailhead for this hike. The entrance fee is good for a week, so save your receipt as it will be valid for the Haleakala State Park at the top of Maui as well for 7 days. Hazards of Note: Be aware of the weather up the mountain, as this area is prone to flash flooding during intense rains. Check with the Park Service before setting out on the 3-4 hour drive to this location from the other parts of the island to ensure the trail is open. Crowd Factor: Busy. 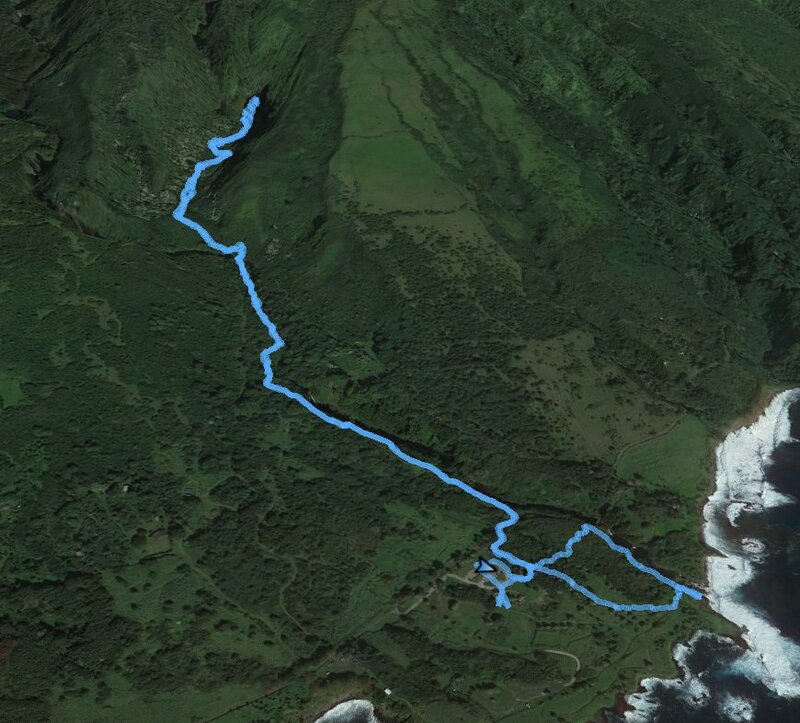 This is one of the premier hikes indicated in most every tour guide for Maui. 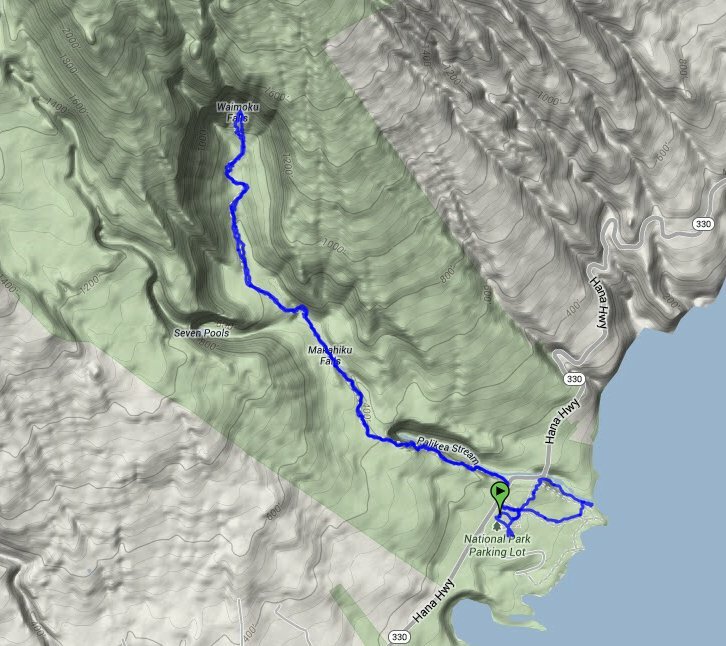 The trailhead for the Pipiwai Trail starts just south of the parking area, and almost immediately crosses highway 330 and heads on up into the mountains. There are steps along the first part of the trail, and then the second largest banyan tree on the island (behind the one in Lahaina) awaits you within the first mile. About halfway up the trail you will come to the first, smaller falls, Makahiku falls across the river from a nice viewpoint. A little further up you will cross a bridge and immediately be inside of a dark, dense bamboo forest that you will be immersed in for most of the next mile up the trail. There is a long boardwalk built for you to walk along on this section, as the ground stays damp here year round and would make a mess of most footwear. At the end of the trail is the nearly 400 foot high Waimoku falls, which cascade down the face of the cliffs encompassing about 3/4 of the area you wind up in. If wet enough, there will be other waterfalls all around the area as well. Do not stand underneath the waterfall as rocks come down as a result of water erosion above the falls area. Annie making her way along the start of the trail. 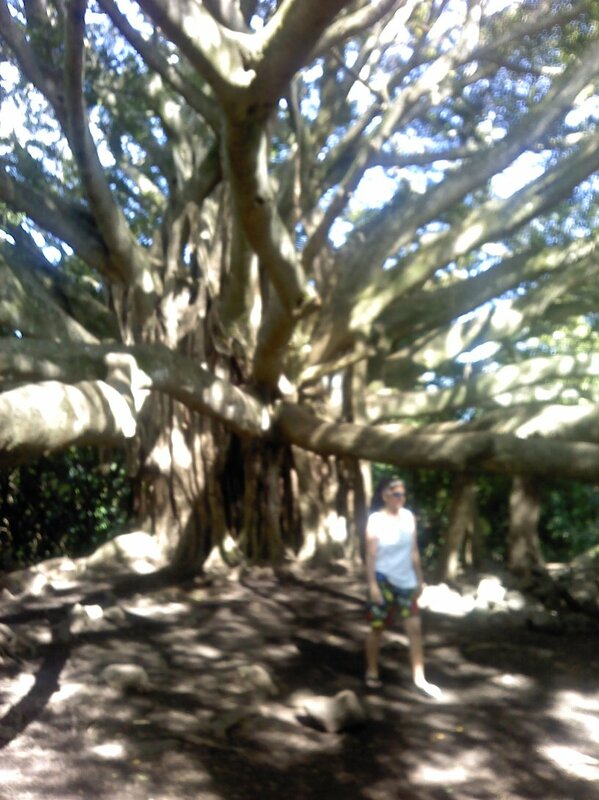 One of the largest banyan trees on the island. Annie enjoying the view of Makahiku falls. Myself at the same falls overlook. More of the falls on the way. 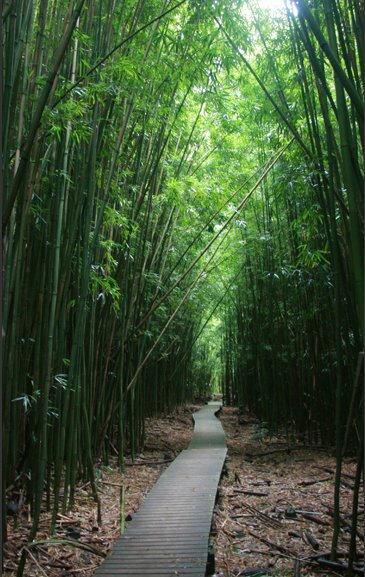 Heading through the very slick bamboo forest section of the trail. 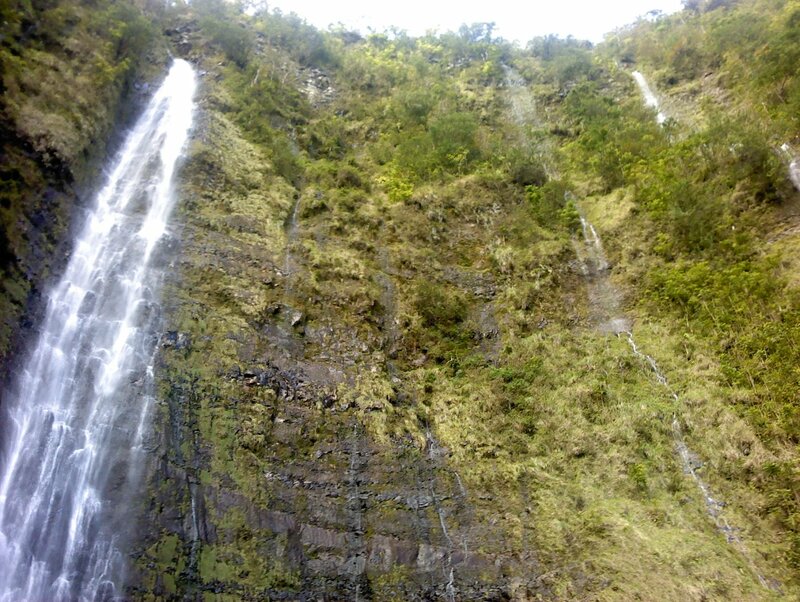 A closer look at Waimoku Falls. Looking up at about 5 different cascades in the area.